Virgin Group Founder Sir Richard Branson and Virgin Voyages President and CEO Tom McAlpin hosted a ‘Ship Tease’, where key details were revealed about what sailors can expect on the first of three ships, coming to the high seas in 2020. Live from Fincantieri’s shipyard in Genoa, Italy, they also celebrated the laying of the keel for the first ship, marking the commencement of construction. Sir Richard and Tom McAlpin arrived on stage via a 200-foot crane drop, in true Virgin style. They were joined by Bain Capital Chairman Stephen Pagliuca and Fincantieri’s Alberto Maestrini to weld ceremonial coins into the keel for good luck and smooth sailing. In a bold and unique move for the industry, McAlpin then gave details that the first ship’s experience will be “Adult By Design” – meaning that sailors must be at least 18 or older to sail. The decision was driven by feedback from future sailors and travel professionals, who are looking for a more elevated and premium experience, with a few Virgin style surprises. The world also got its first glimpse of the ship’s distinct livery, which will feature a sleek silvery-grey hull, with smoked glass, and of course, distinctive touches of red. The livery was conceptualized by Ben Christie and David Azurdia from the multi-award-winning Magpie Studio in London. RWD from Beaulieu England, who are leaders in super yacht design, created the iconic red Virgin funnel of the vessel. 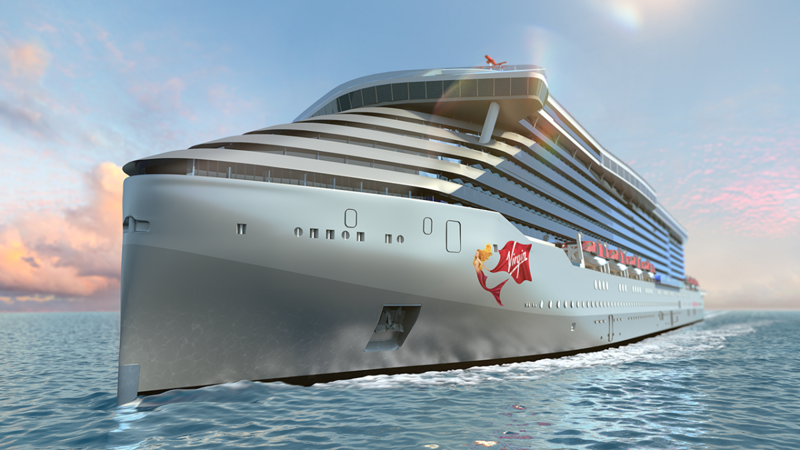 Virgin Voyages’ first fleet will be known as the “Lady Ships”, a play on the term ‘your ladyship’, giving a nod to Virgin’s British heritage. The spirit of our ship will be represented by a beautiful mermaid design that will adorn the bow. The mermaid is inspired by figureheads on historic vessels and was designed by London-based artist Toby Tinsley, who also designed the beautiful feminine motif on Virgin Galactic. Consistent with their commitment to have one of the cleanest fleets at sea, Virgin Voyages signed an agreement with Scanship, providers of advanced waste management systems. Together, they will explore the development of potentially game-changing technology that could one day significantly reduce ocean discharge by turning waste into energy. The final announcement from Virgin Voyages is that it is now “open for business” at virginvoyages.com. Future sailors and travel partners can place a $500 refundable deposit for access to an exclusive pre-sale before Virgin Voyages goes on general sale. McAlpin wrapped up the ceremony by introducing Grammy Award-winning artist Boy George who then performed as the night’s superstar DJ.